There are just a few rare and brief moments, when you can step out on the course of the Self-Transcendence race, and see and hear no one. And if these moments are truly serene, then no cars will be whizzing past on the busy expressway nearby as well. If you were to plant yourself, under some dim street light, in even the remotest corner of the course it is never long, before a shape will soon start to emerge out of the gloom. The sound of running shoes shuffling or springing forward, will come to your ear, and you will know for sure that this place, even in darkest hour of night, never stops moving, sleeps little, and dreams of only pushing forward. We who visit briefly, need time to touch the pulse that beats so strongly here. The movement that the eye sees here, is incidental to the current of life that is surging so powerfully in all who run and work and contribute to making this magnificent dream come into being. The time has just drifted past midnight. Sandhan i and Sahishnu are the late night race directors and they will soon be relieved. Sandhani tells me that all the runners this year came with respect for Sri Chinmoy. He tells me that any uncertainty the runners might have had, as to the race going on, disappeared when they got here. In fact, it is the second biggest field ever. He tells me that he feels Sri Chinmoy's presence here powerfully. I ask him why he continues to do this job, that keeps him up so late into the night. He laughs at this, there is no doubt or question as to his being here, "it is my sadhana. Doing this is my first, and foremost love. I embrace it gratefully and do the best I can." I ask Sahishnu how he is, he tells me, "I am freezing." I don't blame him, he has probably been here more than 5 hours and the temperatures have dropped into the 40's at this time of the night. He also showed up at his restaurant this morning at 7, and it will be well past 1 in the morning before he can go to bed. He is the one to keep track of all the results. One of the counters has mislaid some of the precious lap sheets, and he will have to find them before he goes home. He tells me, that until the whole race is put to bed, he can't relax. He is very proud of runner Madhupran. 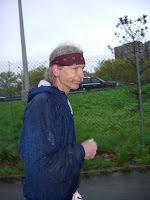 On the horrendous rainy day, he tells me that he ran 84 miles. In the first 48 hours of the race he slept but one hour. Who knows how many hours Sahishnu will sleep tonight. Pranab is one of the full time volunteer race helpers. He is manning the scoreboard and I have no idea how long he has worked here today. There are few runners, out of the 75, on the course right now, but you still have to be sharp. Medur has just arrived. His shift will keep him here till about 9 in the morning. 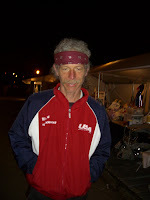 He has started counting runners, and is also juggling numbers that get no lighter to handle at this hour of the night. 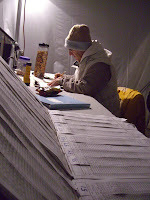 Later in the day, he will also be assembling and putting up the results, on to the race website. He will also receive an email from me about this story. He will then paste this information into the section called, Runners stories, so that you can read this. He really doesn't know how many hours he has spent working on the race. Or does he have any idea when it will be all over. He is just one of the many willing and cheerful people here, volunteering without complaint. 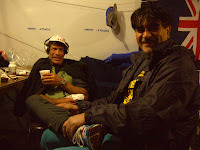 Tibor and Ashprihanal are counting the 10 day runners. 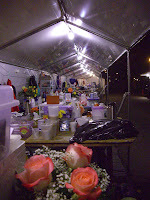 It is so late, that it is not difficult to keep track of the runners. They are eating snacks to keep awake and Tibor has just told an interesting story about the most beautiful horse in the world, and the sad story of what happened to it. Tibor and Ashprihanal' s story has a happy ending, when they go home around 9:30. They are also pretty happy right now. 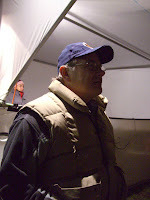 Rupantar is the overnight race director. He has been doing this job a very long time. He has brought out an amazing variety of new snacks and a case of red bull, which over a long night, may prove crucial. He tells me that there is a super field in the race this year. "Its a good race." Like everyone, he is glad that the rain is over. 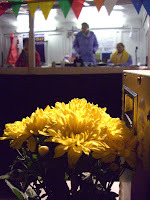 But he says with some amazement, "no matter what the weather is they are out there." He jokes with me now and describes this race as a 5 star event in the world of multi day races. He laughs, "This is how people spend their vacations." 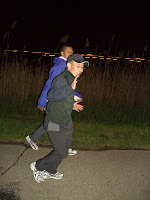 Katsuhiro is still running with his Japanese friend Yoshi. When I left at 7 pm they were running, and they had been together all day. Now it is nearly 2 am. Who knows how many hours and miles they will run together. For Kastuhiro, he will still have a lot of running to do, before he stops on saturday. Fred and Luis emerge out of the darkness, all wrapped up in heavy jackets. 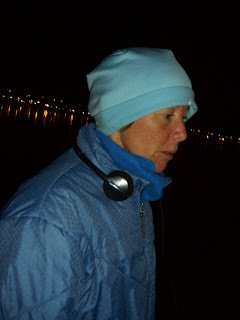 If you are not running, the cold and dampness, of this time of the night, can be raw and tough. Walking with a friend, makes the miles easier, and makes the sun's arrival happen, just a little quicker. Arpan is working on one last runner before he heads home. He tells me that, "its a long night, a lot of massages." 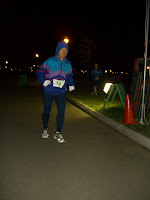 He describes for me, an image of the night time aspect of the race. 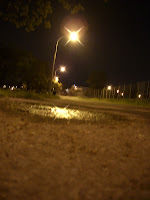 "When I see people walking in the middle of the night, it inspires me more than people running in the middle of the day." He feels that the effort is so much greater to continue at that hour. "People should be sleeping and its cold." He has been putting off going home for a while. He tells me, "Its hard for me to leave." 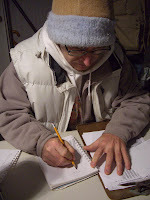 Yuri is working on runner Glenn Turner. Yuri is the father of the youn g girl Alika who was so visible at the race a few days ago. Yuri tells me that he is a licensed massage therapist. His son is with him tonight and has been helping in medical. He describes his particular method as, "energy work." I ask him to tell me about the leg that is now under his hands. He says, "its a perfect leg, just tight." Gary Cross is heading off to take a break. He put on his own 6 day race, just 2 weeks before coming here. I ask him what he sees in this race that he likes. He tells me, "every body is genuinely concerned. They care for you, and the runners look out for each other." 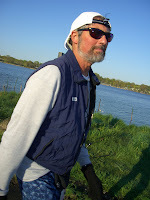 John Geesler is now firmly into his 6 day race groove. He says the second day was tough, the day it rained. Now however, he tells me, that he is experiencing the 3 day groove, that so many of the multi day race athletes have talked about. He tells me, "It may not be easier, but it feels easier." Runner Mark Dorion has been at this race many times and tells me that his wife and daughter are coming here for the first time tomorrow. 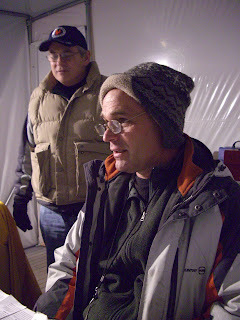 Andy Cable has driven down from Connecticut, to support the race, and his friends here. He ran the 6 day here in 2007. He came, he tells me, because he wanted, "an opportunity to be part of it." He plans to stay all night and leave, so that he can be at work at 8:30 in the morning. He says of the experience here, that he learned patience from his feet to his head. "Everyone is helpful, they lift everyone else up." I am there when Bob Oberkher comes past for his 400th mile. If it had happened during the day there would have been a bigger celebration. The bell was rung, and he came over to the counters to celebrate. He is very happy. Everyone is also happy for Bob. I have been searching for an excuse to leave and cannot find one. I keep taking more pictures and talking to more and more runners. Then Dipali comes by, and wants to tell me a story that she had forgotten to tell me the other day. 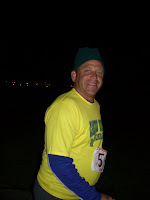 It is a story about Sri Chinmoy and his very deep and loving connection with this race every year. She tells me that, one year, during the race, he was at his home, and there was a group of his students with him. It was a relaxing evening, and before they left he told them something amazing. He said, that while they saw him there with them, another inner part of himself was also at the race, inspiring and encouraging, all those who were here. She gives me a smile as she says this. It is one that suggests clearly, that even now, he is here inspiring all who are here, to go on, to go on. What a difference a day makes. At this same time yesterday, the conditions on the course where just about as bad as they could be. 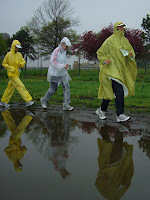 Today has dawned bright, clear, and fresh, and those same runners, who told me how, they just barely survived, through the heavy rains yesterday, are now in a kind of runners seventh heaven. Alina Sikorsky tells me that she feels great. I am surprised when she tells me that this is her first multi day race. 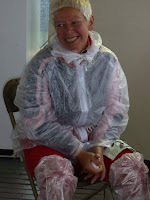 In fact the furthest, she has run in the past, is just the 26 mile marathon. At this point, in her 10 day adventure, she has run 210 miles. I am curious as to why and how, she has made such a dramatic leap in race lengths. She describes, how for the past 2 years she had helped in medical. She looks at me with such sincerity, "I am not a good runner, its about inner strength, inner connection. The most important thing is that I am on the road." This road, that she walks so serenely now, of course, was not so long ago, fraught with many obstacles. She confesses, that in her normal day to day routine she is often bothered by stress and other worries. 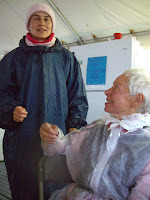 She tells me, how yesterday during the night while she was resting, her tent got flooded. In her current state of being she says, "I was not affected. Things come and go, and I am in a stat e of happiness, I am surrendered." During the rains yesterday the kitchen was often a haven for those who wanted a hot drink, or walk for just a brief, while on firm dry ground. Katsuhiro Tanaka is in second place in the men 's 6 day. He was joined for the day by friend, Yoshi Nishimura. Yoshi tells me that Katsuhiro is a good runner. He gives me the thumbs up sign. 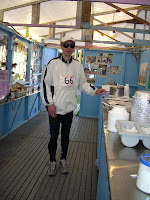 Katsuhiro speaks very proudly of Yoshi, he tells me that he has run the Spartathlon in Greece 11 times. At 7, there is a shift change at the camp. One group of tired counters goes and another experienced group fills in the still warm chairs. The runners never get a shift change. Their chairs rarely get warm. 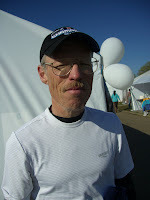 Frederick Reiner, from Salt Lake city is a very young looking 60 year old multi day runner. 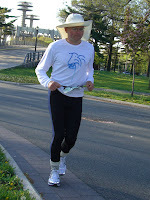 He has competed in 125 ultra events over the past 30 years, and this is the 5th time he has participated in the Self-Transcendence race. He speaks frankly about his race experiences here. 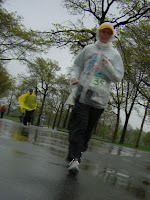 He says, "I have learned more with the Sri Chinmoy marathon team, than all the other races combined." Fred's personal philosophy, is not about how fast you are, but how far you go. He comments, not jus t how well organized this event is but how far people will go in order to help. He tells me that when he needed new shoes they were bought for him. He holds up a coffee and tells me that they even brought that for him. He feels, that in long distance running events, it is one of the few sports where people genuinely assist each other, in order to improve the others performance. He can not find enough superlatives to describe how much help and support, he has received here over the years. He also describes, how the race is like a microcosm of life itself. "It is the journey and not the destination." He also describes how important the family atmosphere is for him here. He recognizes so many people who not only run but also help. He describes that when a runner drops out, "there is an emptiness, when that person is not here. Its not about the numbers, its about the feelings." 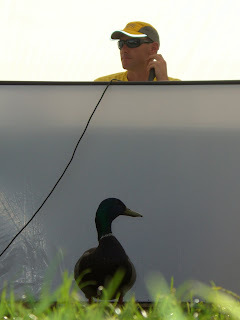 Has anyone seen the duck? Don Allison is one of the truly important figures in distance running. 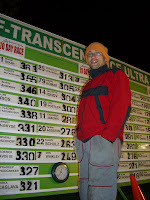 Up until last July he was the owner and editor of Ultra Running magazine. He has been here supporting his friends and the race here for the last 5 years. 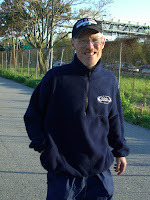 We speak at length about his early distance running experiences. Starting sensibly enough, by running marathons in the 80's, and then at age 37 in 1992 of running a 50 miler in a time of 6 hours 15 minute, which he could never beat, no matter how hard he tried. He called it, "beginners luck." He is still remarkably fit and for the past 3 years has biked to this race from Boston. A distance of 285 miles, that was not helped yesterday by the torrential rains and the elusive bike lanes of the New York city bridges. His first encounter with this race, he recalls, was a powerful experience. He was of course familiar with the Sri Chinmoy races, but had never been to one in person. 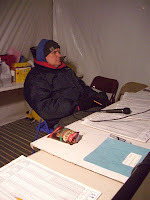 A friend of his, back in 2003, Danny Ripka, was entered in the race, and asked for him to come. His stipulation though, was that should he win, he would have to be on the cover of Don's magazine. He describes how he intended to come, for just a couple of days, and instead stayed for the week. He says with enthusiasm, "this was an entirely different event." He was taken aback at not just the organization, which he describes, "I saw everybody else amazed at everything here. It was surreal." Added to this, was the fact that his friend Danny, was in a battle to the finish, with women's champion, Dipali Cunningham. He tells me that with just a short time left in the race, Danny had a slim 10 mile lead over Dipali. He was so tired that, "Danny couldn't lift his head." But in a supreme act of transcendence he got back out on the course and, "ground out another 6 miles, to beat her by 2 miles." Don speaks with passion, as he recalls this experience. For a writer who dreamt of the romantic aspects of competitive sport, what drives athletes, and the circumstances of their lives. This was a pivotal event. When he returned to Boston, he wrote the article, "w ith everything I had." He describes trying to put the reader in a place of actually experiencing the race fully, as if they were there in person. He calls that race, a spectacular act of perseverance. He speaks now wistfully of the world of distance running. He points back to the green counting board, now swollen with numbers. "You can look at numbers all day long and you can't really appreciate it." He pauses in reflection, "What it takes just to run one mile." Pradeep Hoogakker, from the Netherlands is running the 10 day for the first time. In a day, now filled with so much lightness, his hat billows about his head like a flapping sail. He appears to be gliding smoothly around the course. When I ask him how he is, he describes himself as, "now I am fine, the last few days have been kind of tough." 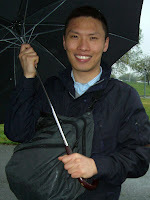 Besides the problem of dealing with the rain, he describes pain in both, his achilles and his shin. He describes to me that he has been, despite the discomfort on the outside, very peaceful and ca lm, within himself. He had run the 6 day last year for the first time and tells me he had gone through many transformative experiences. He relates, that despite some of his inner and outer challenges then, he realizes how much he gained from running the race. One day after it, Sri Chinmoy in fact gave him the spiritual name, Pradeep, which means, 'Climbing Aspiration Heart Lamp." He tells me that in order to honor the memory of his teacher, he ran 76 miles his first day here. The age, Sri Chinmoy was, when he passed, and the furtherest, first day mileage that he had ever accomplished ever before. 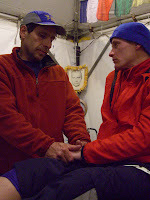 He tells me with utmost sincerity, that, "Sri Chinmoy is still here." We are running by some beautiful blossoming trees and he points to them with a smile spread across his face. He says, every lap I picture that he is there, there under the trees. This inspires me for every lap, for every mile, for every day of the race. 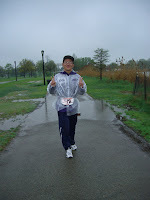 When I arrive at the race this afternoon, race director Bipin gives me this description of the weather, "the rain is not bad, its overwhelming." It has been raining steadily all day, and as I sit under the relative safety of the counting shed, to try and take some pictures, it begins to pour down heavily. It was wet as well last night, and I bring news to the crew, that after checking the latest forecast, it looks as though it will be another wet night ahead for them again. But most, if not all, are in good spirits. Over the years the race village has seen worse. I dare not mention the word, but I think to myse lf, "thank God there is no wind." I am told by the joking crew that Aaron is the official Puddle Manager of the team. 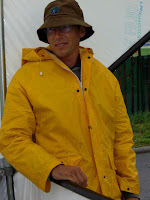 He tells me, "Its a loosing battle with weather like this, we must continue." 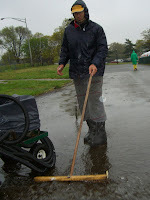 The puddle battle goes on, with the use of men with brooms, and 3 pumps out around the course. You might not recognize her from this picture, but here, buried under many layers, is Dipali(on the right). 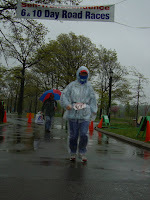 In fact, most of the runners, on a day like this, are hard to recognize. Just imagine how difficult it then must be, at night, when it is dark, and you have 75 different runners, pushing out of the wet darkness, into a slim pool of light. Dipali completed 105 miles in her first 24 hours. She tells me, that as long as she achieved over 100, she would be satisfied. Clearly it is tough for all out there, under these kind of conditions. She says to me, not with complaint, not with worry, but with the honesty of one who has been he re many times before, "It s hard." This is Tommy Gouin from Quebec, with his mom Chantal. Dad, Michel is doing very well right now in the 10 day race. Tommy had just run off to check his dad's mileage and has written it on a piece of paper for me. Chantal tells me that whenever her husband goes to a big race, the whole family goes as well. He misses school of course, but she home schools him on site. When I came in, he was busy looking at a school book. Chantal tells me, that it is a good experience to be together like this, and have new experiences. I ask her if her husband minds the weather. She says, "Its not difficult for him, he likes it." 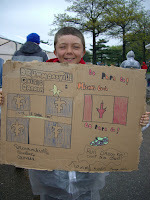 Tommy is very proud of this sign, but I think he is most proud of his dad. click the button to see the Guoins run together. This is 63 year old Marion Landry(on left) from Montreal, finishing her 300th mile of the 10 day race. She, and her husband Donald, have run nearly every mile together over the last 5 days. 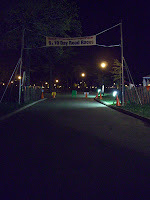 Last year they ran the 6 day race for the first time. Donald tells me, "It was the best experience we ever had." 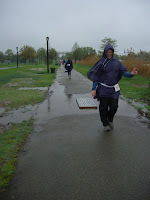 When I ask, why they came back, and chose to run the 10 day race, he says, "we wanted to do it before we got too old." I ask what made the experience last year so special. He says, "basically w e got a positive vibe. It caused us to exceed our goals." He confesses that he sometimes gets grumpy, but last year he was happy the whole time. We run by Pranab, from the Czech republic, sweeping water off the course. Donald looks at this sight, with a kind of amazement, "They are working so hard to put this on, so we too have to work hard too." I ask him, if he knows much about Sri Chinmoy's philosophy, and he tells me, that he really doesn't know much at all. He says though, that by judging by the positive attitude of all those who help out here it must be positive. Then he smiles and adds, "it rubs off." John Geesler is a little disappointed. He tells me that, as for attaining his goal of 138 miles, "before 12 hours I knew I couldn't make it." He now is adjusting to his second goal, which is simply to run now a good 6 day race. He would like to complete 500 miles in that race. He tells me, with a look, as good as possible on such a wet miserable day, "I will do, just as good as I can." Barbara Sorrell, who wanted to run 80 miles for her first 24 hours tells me, "I met my minimum goal, I did 68." This is such a new event for her. She is a bit surprised, I suspect, that she walked so much. She tells me though, "I am a good walker." She is amused at all the things she is learning. She describes being, "reduced to basic elemental needs." She is amazed that everything seems to take so long. How it took her an hour to get ready this morning. She is proud when she tells me how hard she worked in the rain, but also gives credit to those who did a great job on the course. She tells me that yesterday's fear is long gone, that she is maintaining a positive disposition throughout the last day. "I was afraid, but not now." She tells me that reading the aphorisms in the camp kitchen have inspi red her. I ask her if she is still on her A plan, and she says definitely yes. Katsuhiro Tanaka is right now about 10 miles behind race leader, John Geesler. Clearly he is having a problem with his leg. He points to his lower shin of his right leg and describes a pain there. He has run so many races I ask if he has had this problem before, he tells me, "first time." 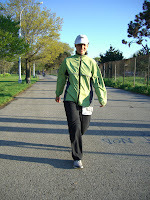 Pratishruti i s a 64 year old runner from Russia, with very much experience at distance running. Last year she ran 507 miles here. She speaks very little English, so a friend comes by to translate. Before we talk, a young Czech runner hands her a new small red rubber ball. She is pleased. On clear days she will run for miles bouncing the ball in front of her. I ask how she is doing, "she says she is joyful in self transcendence." She says how inspiring it is for her to have so many young new people in the race. "T hey are bringing new aspiration to this race and to humanity." Referring to Sri Chinmoy, she adds, "this is what our teacher was dreaming about." She then tells me an aphorism she has written, and which inspires her. "The new millennium is knocking at the window, uncertainty is gone." I ask what she thinks her presence in the race does for the young people. She describes for me, that a person who challenges age and all boundaries can be fulfilled if it is God's will. She tells me, "there is no age limit, we are all on an eternal journey." 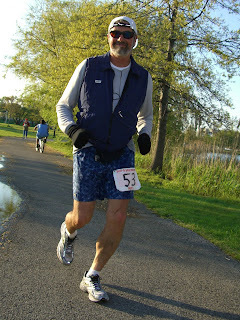 76 year old Sam Soccoli saw his goal, of setting a 48 hour age group rec ord slip away. His wife Emma is here supporting her husband, and says of him, "he's a good guy, the best." I ask him what he will do now, he says positively, "I still have 6 days to complete, I have put in too much to give in now." He tells me it is now time for plan B. He is very proud of his wife and wants me to know that she is a runner as well, and that she ran a 24 hour race 7 years ago. He concludes, "I don't believe in giving up." His wife nods, "he doesn't"
I spot Jimmy with his big umbrella. He tells me he comes by every day and lives close by. He is very inspired by all this. He calls it special. "6 days seems long but 10!" I ask him what he feels about the race, He tells me, "it makes me feel that I can extend myself. Even the term, Self-transcendence is perfect." Do or do not, there is no try...Yoda "Star Wars"